» A 1001 MIDNIGHTS review: CLYDE B. CLASON – Blind Drifts. A 1001 MIDNIGHTS review: CLYDE B. CLASON – Blind Drifts. 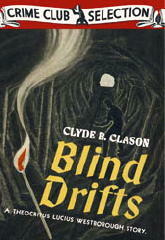 CLYDE B. CLASON – Blind Drifts. Doubleday Crime Club, hardcover, 1937. Mild-mannered Professor Theocritus Lucius Westborough, an expert on the Roman emperor Heliogabalus, is an amateur sleuth in the classic mold of the Twenties and Thirties: He solves convoluted puzzles through the time-tested Sherlockian methods of keen observation, a storehouse of esoteric knowledge, and deductive reasoning. Westborough — and his creator specializes in locked-room “miracle problems.” Even the best of these offers no challenge to John Dickson Carr, but for the most part they are cleverly constructed and well-clued. The one in Blind Drifts offers a particularly neat and satisfying variation on the theme. Westborough’s home base is Chicago, but here he travels to Colorado to visit a gold mine in which he has inherited 70,000 shares. 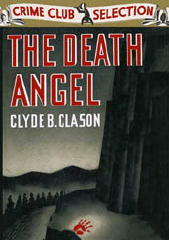 Not long after his arrival, he finds himself investigating, first, the disappearance of one of the mine’s directors, and then the murder of its owner, Mrs. Coranlue Edmonds, known far and wide as a “bearcat on wheels” — a murder by shooting that takes place in front of seven witnesses, in a “blind drift” deep inside the Virgin Queen mine, by a seemingly nonexistent gun. The plot is twisty and complex, the clues numerous and fairly presented, the motive for Mrs. Edmonds’s murder plausible, and the method likewise. The Colorado setting is well depicted, as are the details of the operation and physical makeup of a large gold mine. It is Clason’s attention to such detail, more than anything else, that lifts his work above the average puzzle story of the period; you can’t read a Westborough novel without learning something, and something interesting at that. The one drawback to this and the eight other entries in the series is Clason’s sometimes florid, often prolix style. Blind Drifts is the only book of his that would not benefit greatly from the excision of ten or fifteen thousand words, and at that it could stand to lose five or six thousand here and there. The most appealing of Westborough’s other cases are The Death Angel (1936), set on a Wisconsin country estate called Rumpelstiltskin, where a murder happens in spite of 1542-to-l odds against it, and a murderer is twice guilty of killing the same man; The Man from Tibet (1939), which features a locked-room murder and contains some fascinating background material on the strange customs and rites of Tibet; and Green Shiver (1941), which has a Los Angeles setting and another “impossible” plot, the solution to which depends on Westborough’ s knowledge of Chinese jade. This review by Bill Pronzini was where I first learned about Clyde B. Clason. 1001 Midnights is a really informative book. I still haven’t read Blind Drifts. And for the reason Steve suggests in the previous entry: original copies of Clason’s books cost a fortune! Hopefully Rue Morgue will reprint Blind Drifts too. Clason seems to have been having some fun with us as the Roman emperor Heliogabablus (Varius Antoinius), the son of Caracella, who was assassinated (like most Caesar’s) was the bizarre and short lived teen aged emperor known for his excesses and his homosexual fixation on a slave named Hierocles or Hercules. Wonder if Clason was inspired by Conan Doyle’s references to the freqeuntly obscene poetry of Catallus in the Holmes canon? Being the expert on Heliogabablus is roughly equivalent to devoting an entire career to the final weeks of the Milard Filmore administration. The cabinet member that sits in the White House on the night of the State of the Union speech while the President and Vice President are both in Congress actually reigns longer and more effectively than Heliogabablus. Sounds as if there is a quirky sense of humor at work in Clason’s case as well as a taste for impossible crime.